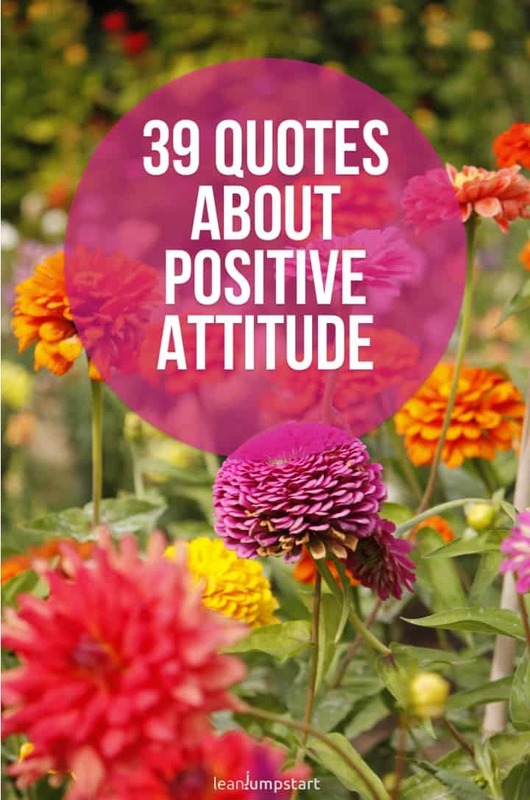 I’ve curated over 39 positive attitude quotes and motivational pictures that will bring more positivity into your life and stop negative thoughts. Because positive thinking has a beneficial effect on all areas of your life. 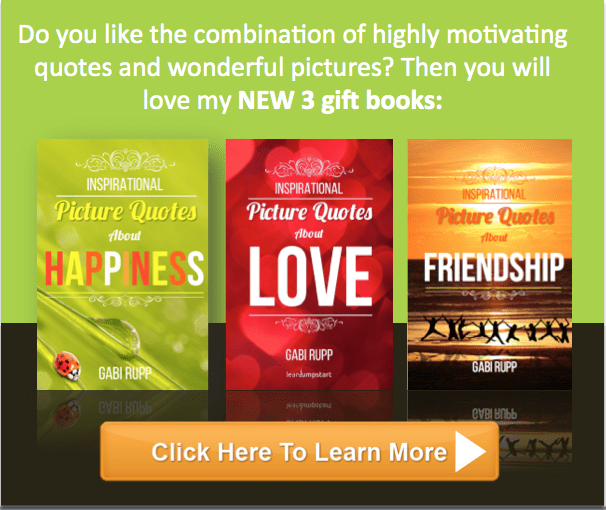 I’ve also created motivation cards for you with positive quotes that you can download for free. These little cards are powerful tools that will help you overcome negative thoughts regarding your body image, habit change, eating pattern, fitness or anything else. Only those who are aware of their negative thoughts can transform them. This should be tackled preferably before these thoughts become emotions and cloud our mood. Mindfulness cannot be achieved overnight and may seem challenging at first. Over time, however, if we persist, it can become a natural part of our lives. Be constructive and focus on things that work! Many people only see what doesn’t work and what they can’t change. Maybe it’s an opulent dinner at the home of your husband’s boss you can’t refuse, or possibly a day when it’s raining cats and dogs and you can’t go on your scheduled jog. A reaction of positive thoughts means not to sugarcoat a situation (something the concept is often blamed for), but it means recognizing where there might be positive approaches for you individually. Instead of looking for something “nice” in your situation, it is much more effective to find points where you can get active and change something for the better. These are aspects where you can influence something in a favorable way. Coming back to the given examples: Accept the opulent dinner as something you can’t change; enjoy it and plan to indulge wisely. See it as the 20% of deviation allowed within our 80/20 clean eating approach. But react immediately the next day with a light breakfast smoothie or an additional workout session. Regarding your workout – you can’t change the fact that it’s raining cats and dogs. But you can change locations and do workouts instead within your home (e.g. Trampoline Jumping). Of course, there will come situations in your life that are frustrating, scary, and maybe even downright awful. And yes, sometimes there doesn’t remain much more than to accept these feelings. That’s totally understandable and ok. But, eventually, something has to happen. Very few situations change on their own – at least not in a way you would have expected. But there is one thing that you can always do: change your point of view! This kind of positive attitude is, from my point of view, a very mighty one. It causes an immediate turn from self-pity and passive victimhood towards an active position. 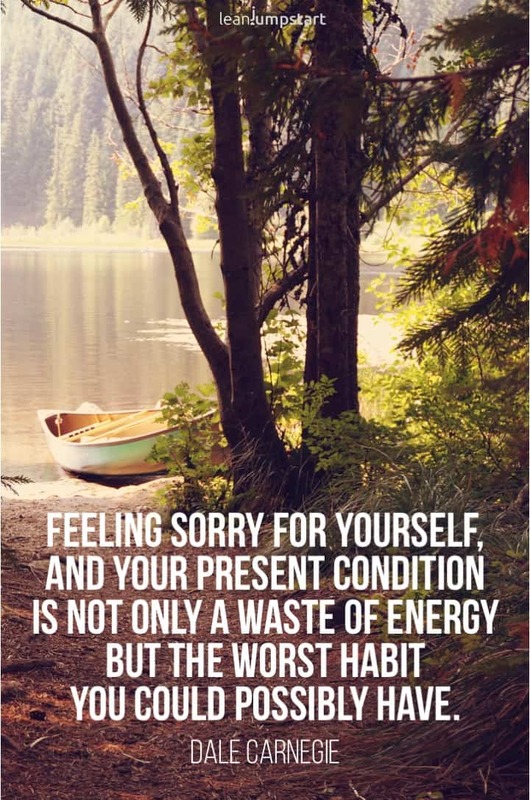 Feeling sorry for yourself, and your present condition is not only a waste of energy but the worst habit you could possibly have. Find that mini-step of action! To get to the crucial step, looking for a very tiny element in a situation that you can tackle can be essential. Finding a mini-step of action and actually implementing it can be fundamental to changing something within you. It causes a chain reaction of positive events and helps you eventually overcoming the situation. This principle of positive attitude and to constantly strive for actionable mini-steps shouldn’t be new to you. My 52-week Chef Habits Ecourse is based on thousands of tiny little steps. There’s so much we can be grateful for! As soon as we focus on the positive aspects of life, we get the enlightening insight that we have everything we need. 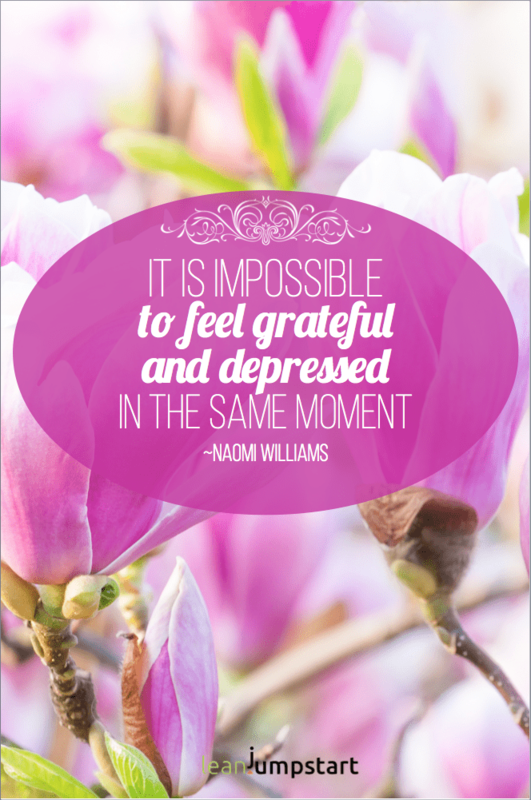 We can experience deep gratitude regardless of external circumstances. It is an inner attitude that we can purposefully use to promote modesty and peace of mind. Do you have already a half-full glass mentality? That’s wonderful! Optimism is a valuable emotional competence, especially when it comes to developing good habits. If you have an optimistic outlook, it is easier for you to embrace change over the safety of the known. 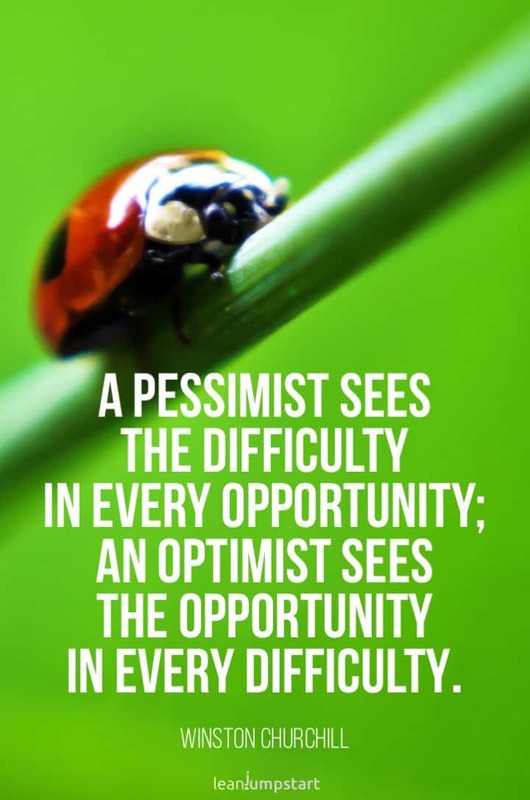 For the lucky of us, being optimistic comes naturally. Positive people with a half-full glass mentality come off as confident, comfortable and happy with themselves. They don’t let obstacles break them down and most of the time it is fun to be around them. 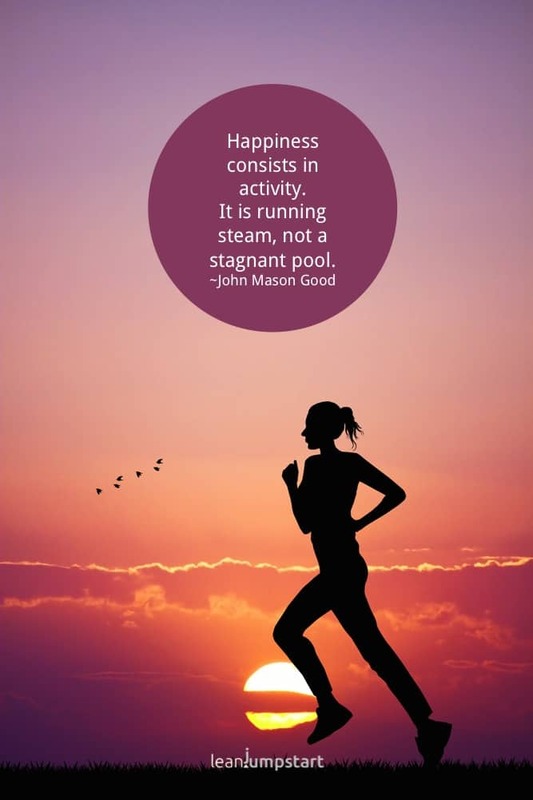 Hence, there is a lot to be gained in cultivating a positive attitude. Click through to learn more about the powerful attitude of gratitude! Here comes the good news if you don’t have this trait naturally: optimism is a hidden asset that can be learned and practiced. It is one of the key factors you need to achieve positive results and be successful – no matter which area of your life it is in. This could be a grateful attitude regarding your health, at work, or anything else. Today, I present to you a strategy you can consider on your journey to developing a positive mindset. It’s a catalyst and it sparks extraordinary results. Use the following quotes in a thoughtful way to reprogram your mind. That way your thought process becomes more optimistic, not only to find, but also to carry out the mini-step of action. See them as a starting point. You’ll find tons of motivational sayings online. Step 2: Do research and write down your own favorite quotation of the day or otherwise words about positive attitudes. Jot them down on special cards or use the blank cards I’ve prepared for you in the pdf file above! Step 3: Cut them out and keep them on your desk, in your wallet or purse, or simply place them on a mirror or fridge. Read them out loud to yourself … especially in times, when you feel you need encouragement. These messages will help you nourish your mind while bringing more success and wellness into your life. Mind your thoughts and say “STOP” out loud in moments when you realize that negative thoughts are popping up. Reprogram the negative thoughts to a positive, productive attitude. 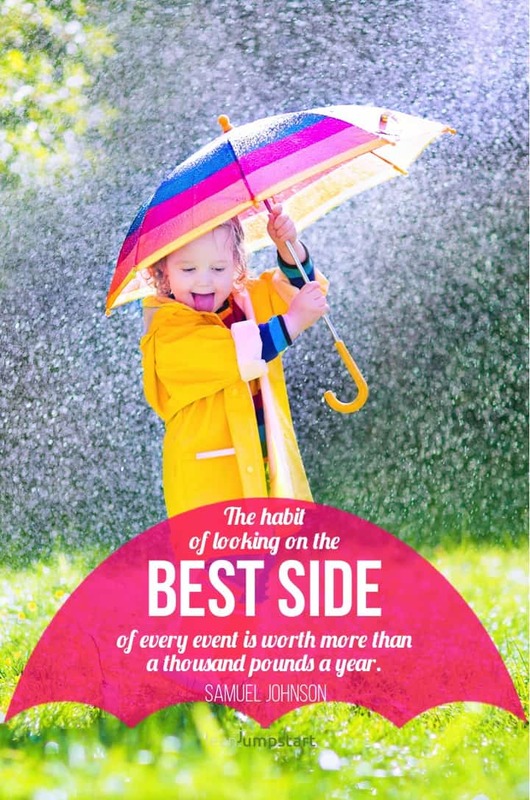 Get visually inspired by 101+ image quotes and cute motivational pictures. Stay away from negative people who are tearing you down because of your weight, clean eating approach, or anything else. Build instead healthy and strong relationships with people who support you from the bottom of their heart. Further Reading: 78 cute love quotes for him and her. If things don’t go as planned, try not to take yourself too seriously. Find a sense of humor in the situation. Need some laughter workout? Click through for my 88 funny quotes about life lessons. Accept setbacks as a minor part of the process that is easy to overcome. Read my blog post on 10 ways a motto in life can give you a mental kick-start and print out your personal life motto. With these “stay positive” strategies, you will exchange more and more negative thoughts with optimistic attitudes influencing your most important life goals but also little objectives in a successful way.